There are various kinds of optical nonlinearities, the strength of which can depend both on material properties and various operation conditions. Often, one uses a kind of effective nonlinear coefficient to quantify such a strength. The following sections give some typical examples. Such a nonlinear coefficient (which can also be called SPM coefficient) occurs e.g. in the nonlinear Schrödinger equation for the evolution of ultrashort pulses in a fiber. Its units are rad / (W m) (radians per Watt and meter). If an ultrashort pulse propagates through the fiber, the total nonlinear phase shift can be simply calculated as above, as long as the pulse duration is not substantially changed e.g. by the chromatic dispersion of the fiber. Otherwise, something like the nonlinear Schrödinger equation needs to be solved for that purpose. Various nonlinear crystal materials are used for nonlinear frequency conversion processes such as frequency doubling, parametric amplification or optical rectification. 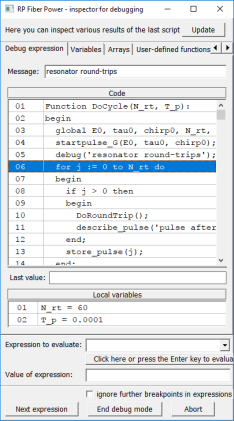 For calculating quantities like the output power or the power conversion efficiency, one frequently uses equations containing an effective nonlinear coefficient deff with units of pm/V. The magnitude of that coefficient depends both on material properties and on the polarization properties of the interacting light beams. and find that the effective nonlinear coefficient is deff = d31 in this example case. The same result would be obtained for light propagation in Y direction, where the pump light needs to be polarized in X direction. In cases with critical phase matching, where the beam direction is not simply along one of the crystal axes, the situation is more complicated. For a given phase-matching configuration, characterized by a phase-matching angle θ or φ, one often requires a formula involving one or more tensor coefficients and the angle. (The relative signs of tensor components may then be relevant.) The required formula depends on the crystal symmetry, which determines the structure of the nonlinear tensor. Figure 1: Phase-matching angle (red, left axis) and effective nonlinearity (blue, right axis) for critical phase matching of frequency doubling in LBO at room temperature, configuration oo-e in the XY plane. Figure 1 shows an example for critical phase matching of frequency doubling in lithium triborate (LBO). For different pump wavelength, phase matching requires different phase-matching angles, and these in turn influence the magnitude of the effective nonlinear coefficient. 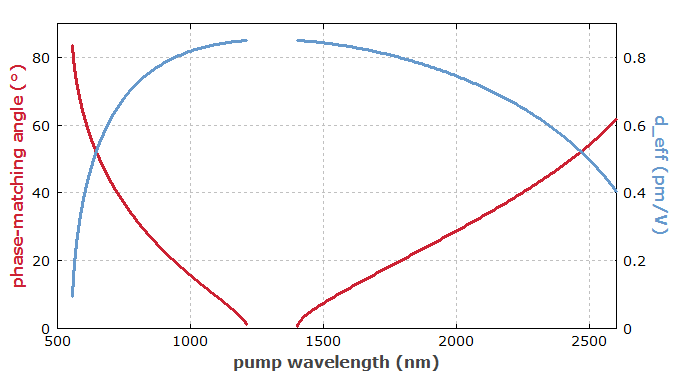 For pump wavelengths approaching ≈550 nm, the nonlinearity vanishes, so that the interaction is not usable, although it could still be phase-matched. In cases with quasi-phase matching, there is another factor 2 / π in the equation for the effective nonlinear coefficient. Its origin is that one does not have perfect phase matching in the material, i.e., periodic phase deviations to one side and the others during propagation, which effectively make the nonlinear infection somewhat weaker. Nevertheless, the achieved effective nonlinear coefficient is often substantially higher with quasi-phase matching than with birefringent phase matching, because one can utilize a higher tensor component (e.g. d33 instead of d31 in LiNbO3). Formulas for calculating or estimating optical powers of generated waves, for example, are not to be discussed here in detail. They often involve the square of the effective nonlinear coefficient, in addition to refractive indices and frequencies of the involved waves, beam radii etc. They are often based on certain assumptions, for example that the transverse intensity profiles remain essentially unchanged during propagation and that the conversion efficiency remains small. Results with more general validity (not requiring certain assumptions) can be obtained with numerical simulations. Since the strength of such nonlinear interactions usually depends not only on the effective nonlinear coefficient, but also on its refractive indices for the involved waves, for comparison of different nonlinear crystal materials one often uses a figure of merit like deff2 / (n1 n2 n3). As refractive indices can vary substantially between different crystal materials, they can have profound effects in such comparisons, which should not be ignored.